I was born around the year 1643 in Paris. My father was a falconer of the king, which makes us part of the French nobility. With my certificate of good conduct in my pocket, I arrived in Quebec in 1665 where I married François Genaple, a carpenter. We settled in the seigneury of Sillery. We then moved to Quebec around 1672 and lived next to the prison where Francois was a jailer. As for me, I was a midwife and I had 9 children. I became a widow in 1709. I took over my husband’s job at the prison in early 1710 and was remarried the following year to René Hubert. I passed away at the age of 75 in Quebec after a very busy life. 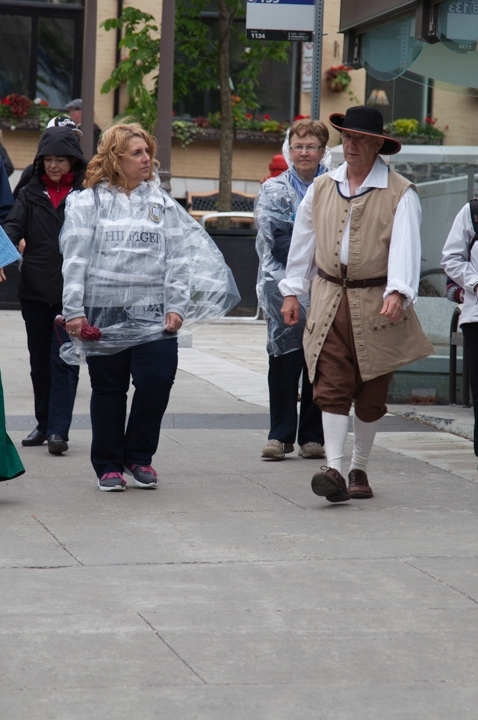 After a career in teaching, I became a tour guide for the city of Québec in 2012. I joined the Filles du Roy History Society in 2014 and I played the role of a Fille du Roy who arrived in 1664. Passionate about the history of the Filles du Roy, I founded in 2015 the Filles du Roy Choir and in 2016, À la Rencontre des Filles du Roy (Meeting the King's Daughter), tourist circuit. I also conduct educational activities in Quebec's elementary schools, as well as training sessions everywhere, which deal with the history of the Filles du Roy, women who are underappreciated in our history. 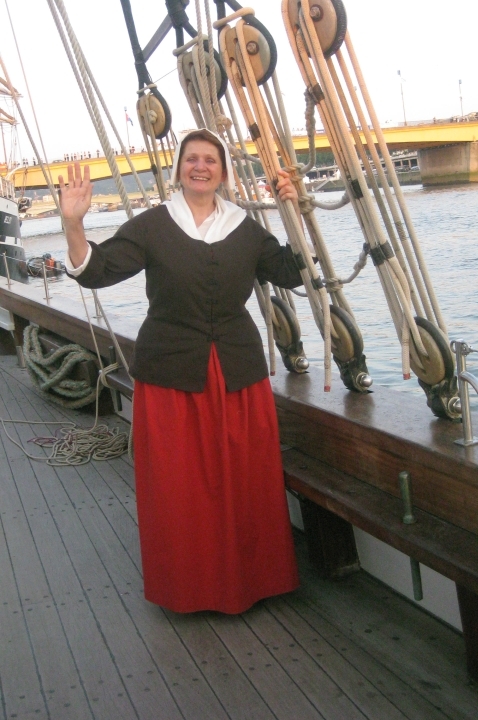 I am Louise Chiasson, Simon Gendron’s widow, and I arrived in New-France in 1666. I lived in La Rochelle, France, for 33 years, and I decided to leave my country for the unknown, hoping to find a husband and have a family. In Québec, I met Jacques Chapdelaine, a carpenter and a wood turner. We got married on September 14th, 1666. We settled in the city because business was better there. In 1670, we were rich enough to buy land and have a stone house built. We lived together until disagreements obliged us to live separetly. I was 66 years old when I passed away. Playing a Fille du Roy allows me to satisfy my passion for the history of 17th-century New-France and the history of women. This is a way for me to go back to my studies : I have a diploma in History and a certificate in Native studies. Recently, I added to this a diploma in tour guiding in Quebec City. Coming from a family of the high society, I was born in 1637 in St-Jean de Canéjan, in the diocese of Bordeaux. 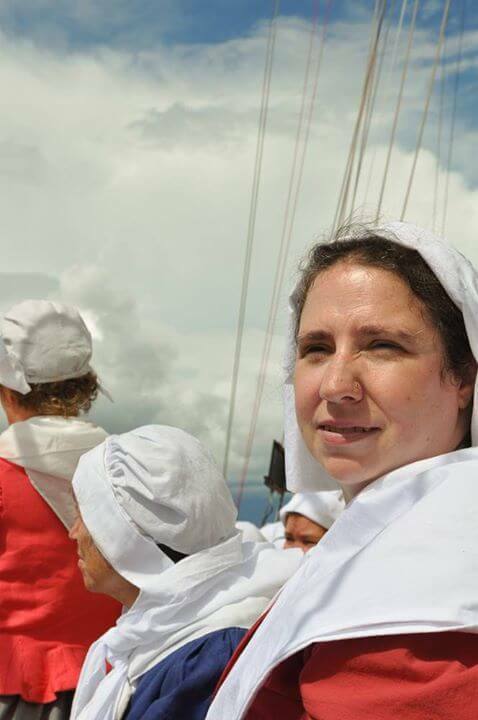 At the age of 26, on 16 June 1663, I boarded the Aigle d’Or with 35 other young women to be married in New France. After a painful crossing of 111 days, I finally landed in Quebec. After recovering my health, I chose Michel Bisson, 23, who had given a parcel of land in the Seigneurie de Lauzon at Point Levy. He had already built his house. The same year we signed our marriage contract and we united our lives at Notre-Dame Church in Quebec. At Point Levy, where we lived, I gave birth to 9 children, 5 of whom survived to adulthood. Michel died at 62 and I at 86 years old, very happy to have decided to become a Fille du Roy! 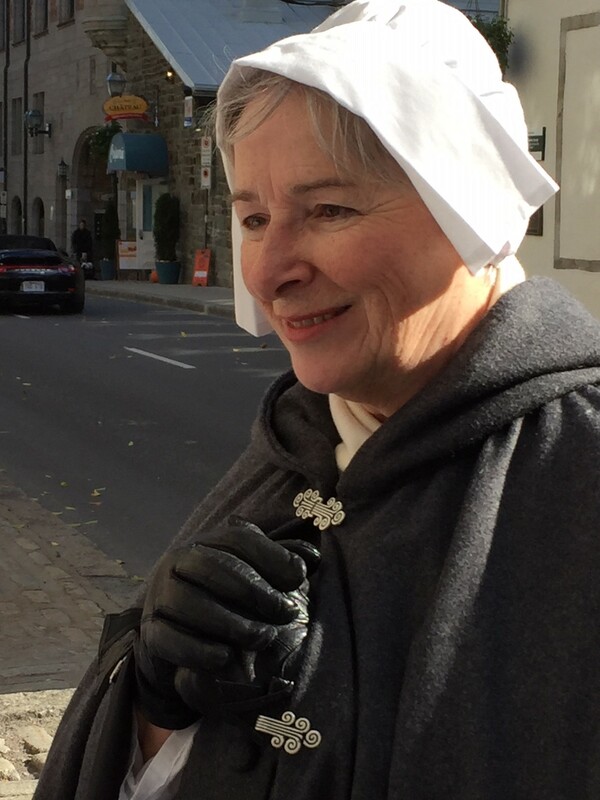 A retired teacher and an accredited tour guide from Québec City, I discovered my passion for les Filles du Roy when I first played the role of Claude Pratte (arrived in 1665). In 2013, on the 350th anniversary of the arrival of the first contingent of the King’s Daughters, I attended the training offered by the Filles du Roy History Society and had the privilege of participating in the Memorial trip in France: In the footsteps of the Filles du Roy. We hope to introduce you to these courageous women and to tell you their story, while walking the ground they walked so many years ago! Originally from the Poitou region of France, I am the son of Etienne Dauphin and Julienne Richard. I arrived in Quebec in 1665, at the same time as the Carignan-Salières regiment. I signed a marriage contract with Marie Morin on October 29, 1665 before the notary Paul Vachon in Quebec. We were married on November 15, the same year, in the presence of several soldiers of the regiment. My wife, Marie Morin, a widow, is a native of Ile-de-France. She arrived in Quebec in 1665, the same year I did and she was part of a group of 89 Filles du Roy. We settled in Beauport where I was employed by Robert Giffard. In 1667, I was conceded 40 arpents of land in the village of Saint-Joseph. Then in 1672 and 1675, I acquired two other parcels of land in the village of Saint-Michel. During our 28 years of marriage, Marie Morin gave birth to eight children. She became a widow again when I died on August 31, 1693 at the Hôtel-Dieu in Quebec. She finished her life in 1729 at the Quebec General Hospital at the age of 84 years. Born in Quebec City’s Lower Town, I am so passionate about the history of my city that in 2012, I become a tour guide. Les Filles du Roy, mothers of the Quebec nation, are the subject of my most recent studies and research. I will be very happy to share them with visitors.